Video poker has a high element of skill so if you do not want to learn optimal strategies or do not have a good idea how to play then you might want to play pure luck games instead but it does offer some of the most generous player betting opportunities online with the chances to win significant amounts of money from your initial wager. Video poker payouts are based on a paytable that is posted somewhere on every game. On real life video poker games, the paytable is usually on the face of the actual machine. 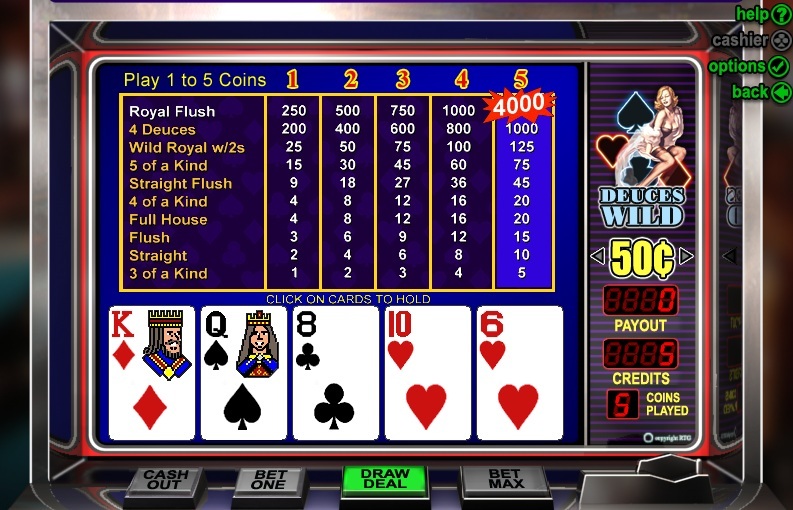 Some online video poker games are designed so that the paytable is visible while playing while others require players to open a menu to view all payouts. Knowing these payouts will be key not only to your playing strategy but to your initial game selection. At first glance, most video poker games look pretty similar, but small differences can greatly affect profitability. For example, a paytable that starts with Kings or better instead of the more standard Jacks or better translates to a tighter machine. Likewise, a payout difference of a single credit for one hand ranking can mean the difference between profiting and not profiting. Once you know which variant you prefer, the next step is to find the best paying version of that game available. Playing the right strategy can make a real difference but it is quite easy to learn solid strategies that will still give you very acceptable payout rates without having to follow or memorize complex strategies. If you are playing online then you might want to print out strategy tables. We particularly recommend that for what ever game you are playing that you get familiar with optimal play recommendations. The website www.wizardofodds.com is a great resource as it not only makes available strategies that are easy to follow for video poker but it also has a program that will enable you to put in the variables for any video poker game and it will be able to provide you with a strategy that will be very close to optimal play. There is a huge amount of variance in video poker so if you do not want to risk busting your gambling balance quickly then keep the stakes low, this is particularly true if you are playing a multi-hand video poker game. Blackjack, another game with a significant skill element has much lower variance than video poker. Often video poker is excluded in the games you can play and benefit from deposit bonuses or the play through requirements are significantly higher so if you are wanting to benefit from bonuses and play video poker then you might need to do a little bit of research to find the right casinos for you. Ideally you would always play at a full pay video poker game. If you can find a full pay Deuces Wild game, for example, it offers a consistent payback percentage of 100.77% when played with a perfect strategy. That might sound like a slim win margin, but at several hundred hands per session it adds up. Unfortunately, very few of those games exist any more either live or online. The next best option players have is NSUD (not so ugly ducks) games. These games offer payback percentages that are just under 100%. When you combine that with player loyalty bonuses and other promotions, these video poker games can also be made profitable, and that’s a perk that few other online casino games offer. To help you identify the best of the two most profitable video poker games – Jacks or Better and Deuces Wild – we’ve posted both the full pay paytables plus the most common NSUD variations to look for below. The quickest and easiest way to identify full pay Jacks or Better paytables is to look at the Full House and Flush payouts; that’s why these paytables are also often called 9/6 Jacks or Better. The NSUD paytables for Jacks or Better games make very minute changes to the paytable. The next best paytable, for example, pays 9 credits for a Full House and 5 for a Flush. It’s also common to see Jacks or Better games that pay 8 credits for a Full House and 6 for a Flush. The online Deuces Wild video poker games offer some of the best odds in a casino, assuming you can find a game with a decent paytable. The NSUD Deuces Wild paytables pay 16 for Five of a Kind, 10 for a Straight Flush, 4 for a Full House and 3 for a Flush, but in return they reduce the crucial Four of a Kind payout to 4.